Lack of safety or efficacy continues to impact the failure rate for compounds entering clinic trials, implying that the current preclinical decision-making paradigm is not sustainable. Animal models and commonly used in vitro assays are simply not predictive of human response. More life-like cell-based models are emerging, and will gain in complexity as developments in microfluidics, miniaturization, and high-throughput screening technologies evolve. These new platforms are designed to improve and accelerate research, and hold great promise for positive patient outcomes through the development of companion diagnostics, pharmaceuticals, and other therapeutics. Advances in physiologically relevant 3D cell culture model systems and high-content and image-based screening were among the topics discussed at “Cell Based Assay and Screening Technologies,” a GCT conference held recently in San Francisco. Heterotypic cell-to-cell communication, blood flow, and transport are essential to restoring human organ biology on the bench. Organs comprise multiple cell types that communicate with each other, and together these cell types maintain homeostasis in health and disease. For example, the endothelium is critical in all organ biology, and is typically in direct, or indirect, communication with the primary cell type of an organ system. “The simple act of culturing two or more cell types together will change their function. 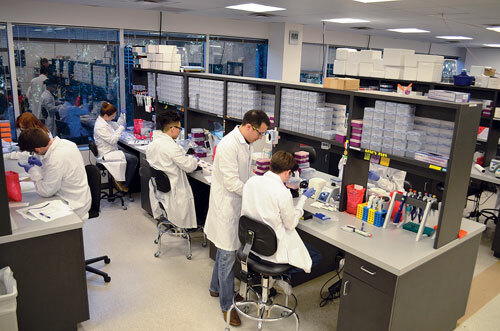 Using the vasculature as an example, in our organ systems we co-culture human primary endothelial cells with human primary smooth muscle cells,” explained Brian Wamhoff, Ph.D., vice president of research and development at HemoShear. “Restoring in vivo prescribed measurements, such as blood flow and transport, restores in vivo-like responsiveness to both cell types. Moreover, it allows us to create never before seen validated human-like disease states not obtainable by any other system,” added Dr. Wamhoff, who also asserted that such results could not be accurately accomplished in 2D monolayer cultures. The HemoShear vascular and liver diseases systems span multiple therapeutic areas, and have been used to screen over 160 drugs across more than 13 drugs classes at human in vivo exposure levels. Some screens validated safe classifications; others retrospectively predicted market removal or FDA black box warning labels. Outcomes ranged from drug-induced vascular permeability, thrombosis, inflammation, injury to liver, steatosis, cholestasis, and toxicity due to oxidative stress. “There are aggressive steps being taken to incorporate human primary cell disease systems in drug discovery, and validation of these systems is ongoing. However, until these systems can be proven to reliably impact clinical safety and efficacy, the industry will continue to deploy decades-old methodologies for decision making, methods that continue to fall short,” concluded Dr. Wamhoff. HemoShear couples primary cells together with human-derived hemodynamic patterns, captured from various high-resolution imaging modalities, to recreate the exact shear forces present in the organ system under study, providing more reliable and predictive results. Immune defense reactions and inflammatory processes rely on a close cross-regulation between local tissue cells and those of the immune system. A reliable and predictive assessment of drug activity profiles must include these feedback mechanisms into in vitro models used for lead optimization and candidate selection for clinical trials. Addressing this need is a system offered by EDI, a subsidiary of Myriad RBM. This system, Human Organo-Typical (HOT) Co-Culture, consists of two Transwell® compartments separated by a 0.4 µm porous membrane. With this arrangement, the system provides in vivo-like cross-talk between the compartments. The upper chamber contains tissue cells, such as differentiated intestinal epithelia, epidermis, or bronchial epithelia, and the lower chamber holds a customized whole-blood culture, optimized for each individual tissue type. For drug-activity profiling, both compartments can be pre-inflamed in different ways to adjust the systems to pathologically relevant conditions, and also to different modes of action of test substances. For example, by adding proinflammatory cytokines to differentiated intestinal epithelia, one may generate enterocyte activities similar to those found in inflammatory bowel diseases. Consequently, this modifies the enterocyte/immune cell cross-talk, which increases the translational value of the results. Used primarily to test for acute and chronic inflammation, immunomodulation also can be investigated in detail, mediated by food supplements, probiotics, nutraceuticals, cosmeceuticals, etc. The medium-throughput, 24-well-format HOT models are used in mid- to late-stage preclinical drug development and enable side-by-side testing of several compounds in dose-response curves, on the cells of different blood donors, in the same experiment. “HOT models do not replace animal testing, although there is the potential to achieve this in certain areas, such as bioavailability. Both options should be considered complementary,” stated Manfred Schmolz, Ph.D., managing director and CSO of EDI. EDI, a subsidiary of Myriad RBM, performs drug activity profiling using their Human Organo-Typical (HOT) models. HOT models allow in vivo-like cross-talk between tissue cells and customized whole-blood cultures. 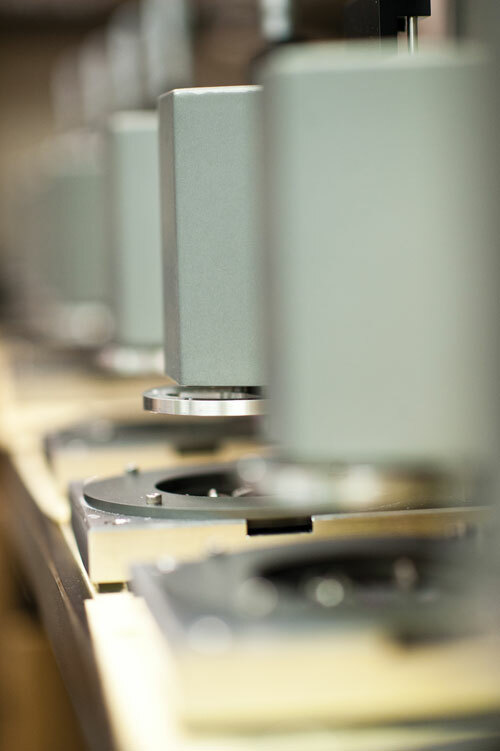 Commercially available assays designed and verified for 2D culture systems are being used for 3D model systems, often without appropriate method validation. For endpoint lytic assays that release a biomarker of interest, the most challenging aspect of applying the assays to larger 3D microtissues is achieving effective lysis of all the cells without destroying the marker targeted for measurement. For reagents designed to diffuse into viable cells, the reagents must penetrate to the center of the microtissue, and the signal cannot be quenched by the large 3D structures. Effective lysis of greater than 350 µm microtissues is achievable using a combination of detergents and physical disruption such as shaking of microwell plates or trituration with a pipette. Intending to improve lysis of large microtissues, Promega is developing CellTiter-Glo®, a reagent formulation for measuring ATP. The company is also validating many of its existing assays for applications using 3D microtissues to ensure that the activity of the markers, such as enzymatic activity of caspase-3, is not destroyed by using excess detergents. The ability to screen drugs against the native receptors expressed by the cells that are involved in the disease process is important. G-protein-coupled receptors (GPCRs) constitute a large family of transmembrane receptors that sense molecules outside the cell, and activate inside signal transduction pathways resulting in cellular responses. Drugs acting at a GPCR produce a complex pattern of signaling that can only be captured by simultaneously measuring multiple second messengers in living cells. Fluorescence resonance energy transfer (FRET)-based protein biosensors produce very small signals, and the donor and acceptor pairs of fluorescent proteins consume large portions of the visible spectrum, making multiplexing impossible. These genetically encoded fluorescent biosensors measure one second messenger, most often just the ubiquitous Ca2+. Montana Molecular’s biosensors use a single fluorescent protein and produce signals that do not depend upon energy transfer. Small changes in the analyte-sensing domains disrupt the chromophore environment directly, producing a large, instantaneous fluorescence change that is considerably greater than FRET-based sensors. The combination of biosensors of different colors in a single assay allows measurement of multiple second messengers, concurrently, in a system compatible with automated fluorescence plate readers. This approach can be used to access mechanisms within living cells that are completely inaccessible to dyes or antibody techniques, and provides a richer view of what a particular drug and receptor are doing. “It is now widely recognized that particular ligands activate different limbs of GPCR signaling differently: some act more through G proteins, others recruit arrestin signaling,” remarked Thomas Hughes, Ph.D., CSO. “Since this agonist bias can have significant therapeutic importance, there is a growing need for multiplex assays that make it possible to screen for agonists and allosteric modulators that produce a particular pattern of signaling rather than simply an indicator for Ca2+. 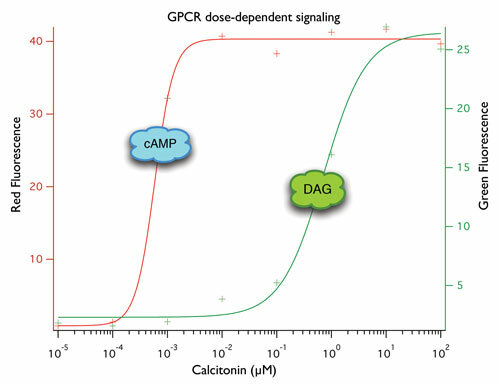 The calcitonin receptor, a GPCR, can activate both Gs and Gq responses at different concentrations of the ligand. Montana Molecular’s red fluorescent biosensor for cAMP and green fluorescent biosensor for DAG detect Gs signaling and Gq signaling concomitantly in a single-step live cell assay. Previous articleBreak Smoking’s Grip by Thwarting Nicotine’s Intracellular Machinations?